The MFC5 STL Expert Advisor analyzes the market over a specified period and sets pending orders. The system does not use indicators and is fully based on the price action analysis. Trading periods - H1, M30 and M15. You can use several EA instances on a single symbol. A VPS server is recommended for stable operation. You may trade manually since it does not affect the EA operation. See the account monitoring results. Contact me to receive *.set files. I will be happy to answer your questions! The EA is suitable both for five- and four-digit quotes. To trade a fixed lot, optimize the EA every month. For better results, I recommend using limit orders on the М5 and М15 periods, while optimization should be performed on H1. 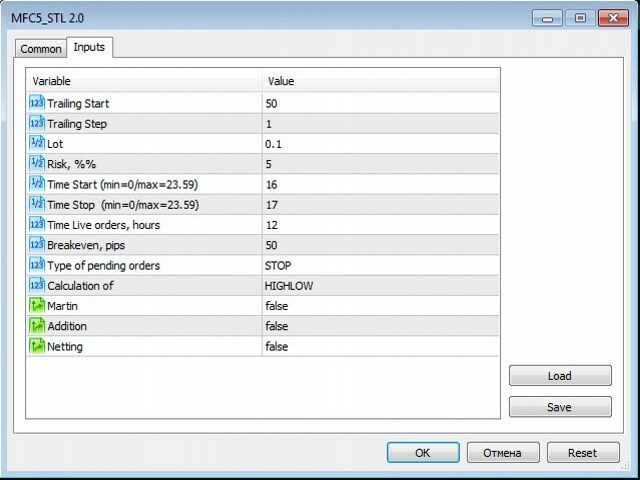 Optimization of the Time Start, Time Stop and Calculation of parameters is usually enough. Follow money management rules. The maximum acceptable risk for all currency pairs should not exceed 10% of the deposit. In case of a long-term trading (3-12 months) on several currency pairs, set Risk %% to not more than 5%.